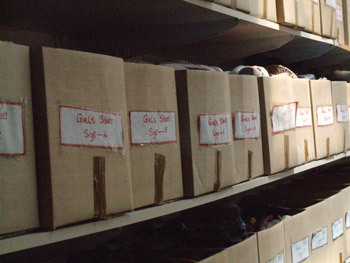 The Clothing Warehouse is a self-sustaining unit at the Care Centre. Donated clothing is washed, mended, and organized by gender and size. It is then distributed in a very systematic way to the people of Missionvale. Twice a year the adopted families of Missionvale receive clothing for each member of their family. Families that have the unfortunate disaster of a shack fire also receive a generous parcel of clothing and household goods to get them started again.